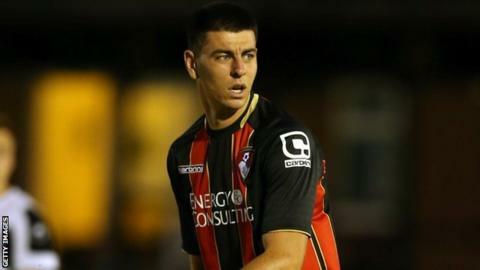 Torquay United have signed Bournemouth youngsters Joe Quigley and Josh Carmichael on one-month loan deals. Central midfielder Carmichael, 20, has made four appearances for Bournemouth's first team and had a spell on loan at Conference side Welling last season. Striker Quigley, 18, who has previously been on loan at Southern League side Poole Town, signed his first professional deal in April. "They're two positive signings for the club," manager Paul Cox told BBC Sport. Carmichael will provide cover for injured Gulls skipper Luke Young, who is still waiting for the results of a scan on a knee injury he suffered last week. "Josh comes highly rated from the Bournemouth camp, he's played in the first team at Bournemouth and he's looking to get some experience of first-team football," added Cox. "Joe has been in and around the first team all season, but Bournemouth have brought in one or two players in and he was available. "He'll add a bit of power and pace and the lad can also finish so he's a good signing for the football club."